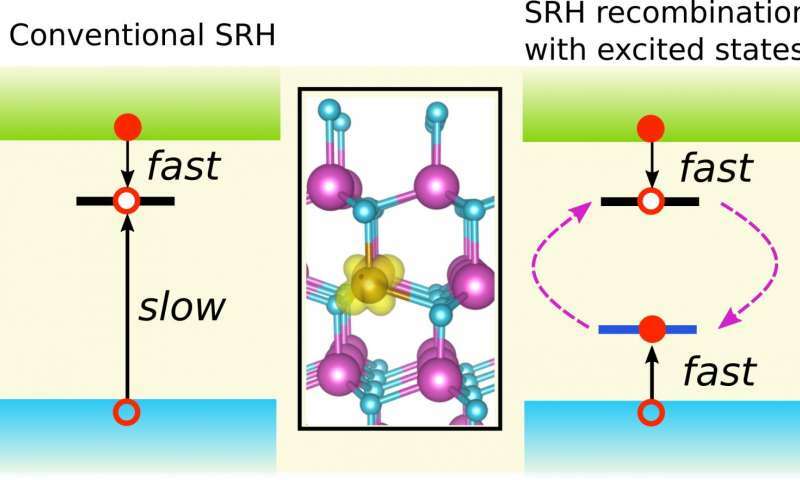 Using cutting-edge first-principles calculations, researchers at the University of California, Santa Barbara (UCSB) have demonstrated the mechanism by which transition metal impurities - iron in particular - can act as nonradiative recombination centers in nitride semiconductors. The work highlights that such impurities can have a detrimental impact on the efficiency of light-emitting diodes (LEDs) based on gallium nitride or indium gallium nitride. For LEDs, high-purity material is essential to lighting technology, such as residential and commercial solid-state lighting, adaptive lighting for automobiles, and displays for mobile devices. Imperfections at the atomic scale can limit the performance of LEDs through a process known as Shockley-Read-Hall recombination. The operation of an LED relies on the radiative recombination of electrons and holes, which results in the emission of photons. Defects or impurities can act as a source of nonradiative recombination and prevent the emission of light, lowering the LED efficiency. The UCSB researchers, in collaboration with researchers from Rutgers University, the University of Vienna, the KTH Royal Institute of Technology in Sweden and the Center for Physical Sciences and Technology in Lithuania, have identified that iron, even at concentrations less than parts-per-million, can be highly detrimental. Transition metal impurities such as iron have long been known to severely impact devices based on traditional semiconductors such as silicon and gallium arsenide, leading these impurities to be referred to as "killer centers." It is therefore surprising that little attention has been devoted to understanding the role of transition metals in recombination dynamics in GaN. "A naïve application of Shockley-Read-Hall theory, based on an inspection of defect levels within the band gap, would lead one to conclude that iron in GaN would be harmless," explained Dr. Darshana Wickramaratne, lead author on the paper. "However, our work shows that excited states of the impurity play a key role in turning it into a killer center." The UCSB scientists identified a recombination pathway by which iron can lead to severe efficiency loss. Sophisticated first-principles calculations were essential to identify and understand the role of the excited states in the recombination process. "Taking these excited states into account completely changes the picture," emphasized Dr. Audrius Alkauskas, another member of the research team. "We strongly suspect that such excited states play a key role in other recombination phenomena, opening up new avenues for research." The results highlight that strict control over growth and processing is required to prevent the unintentional introduction of transition metal impurities. Sources of iron contamination include the stainless steel reactors that are used in some growth techniques for nitride semiconductors. "Increasing the efficiency of light emission is a key goal for the solid-state lighting industry," said UCSB Materials Professor Chris Van de Walle, who led the research team. "Our work focuses attention on the detrimental impact of transition metals and the importance of suppressing their incorporation."